Precision pneumatic sandwich mount speed control was designed with advanced throttling technology for controlling the opening and closing speed of spring return pneumatic actuators. The speed controller is able to control the rotary speed of the actuator accurately, consistently and safely reduce the fluctuation common to brass speed control mufflers. Directly mounts between the spring return pneumatic actuator and Namur 3/2 solenoid valve. Optional adapter plate with pipe connections can be used in place of direct mount solenoid valve, for use with remote pilot valves and/or pneumatic positioners. The actuator speed can be adjusted separately or simultaneously by two knobs located on both ends of the speed control valve and held in place with locking nuts. 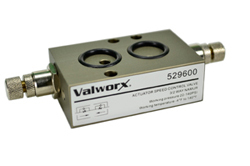 Speed control is PRE-INSTALLED when ordered with a Valworx air actuated valve.